The day is May 6, 2007, France's run-up to the presidential elections. As the French people are getting ready to go to the polls to elect their new president, presidential candidate Nicolas Sarkozy has shut himself away in his home. Though Sarkozy soon knows he has won the election, he is alone, gloomy and despondent. For hours he has been trying to reach his wife, Cécilia but to no avail. The last five years unfurl before our eyes, recounting Sarkozy's unstoppable ascent, riddled with in-party backstabbing, media manipulation, riots, sarcastic confrontations and extra-marital affairs. THE CONQUEST chronicles the volatile right-leaning Sarkozy's startling rise to become President of France and the emotional and psychological stakes involving the conquest of power. On the day the diminutive Sarkozy conquered his ultimate ambition, his wife, who for twenty years had struggled to pull the man she loved from the shadow into the light, walked out on him for another man. Renowned French playwright Xavier Durringer exposes with knowing and sardonic overtones the absurdness behind political campaigning. Based entirely on public documents and first person accounts, THE CONQUEST reveals the inner machinations of a bitter campaign in a new media age. Long the subjects of journalistic accounts analyzing how modern elections are won going back at least to Theodore White's 1960 classic "The Making of the President," politicians - either living, recently deceased or thinly disguised - are turning up more frequently in feature films. 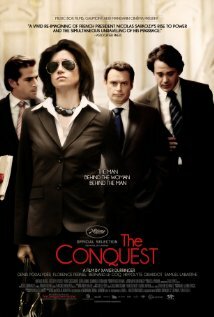 THE CONQUEST is part of this vibrant sub-genre of generally satirical films that includes the upcoming IDES OF MARCH, THE IRON LADY, GAME CHANGE and recent films such as W., THE QUEEN and IN THE LOOP. However, THE CONQUEST is the first film to expose the drama surrounding the election of a leader during his term in office.